These cards are marketed to people with poor credit. In fact, if you've declared bankruptcy, you probably have already received offers for subprime credit cards. As tempting as these offers might be, you need to be careful. Typically these cards come with low credit limits of a few hundred dollars, sky-high interest rates, and high annual fees. Those fees are now limited by new federal credit card regulations to no more than 25 percent of the first year's credit limit, but there may be other costs, such as an upfront processing fee. For a credit card with a $500 limit, the annual fee alone would stick you with a $125 balance before you even say, "Charge it." Prepaid credit cards have proliferated in the last few years, and now they're on sale seemingly everywhere--from Super Walmarts to tiny convenience stores. These cards have Visa, MasterCard, or Discover logos, and you use them as you would a regular credit card. But instead of racking up debt, you load the cards with your own money, draw down the balances as you charge, then reload them. The downside? You have to buy them and pay fees, which may include costs for monthly maintenance, ATM use, bill pay, and other standard services. You also don't get the same liability protections as you do with regular credit cards if they're lost or stolen. To get a secured credit card, you must open and maintain a savings account, which can serve as backup in case you default. Your credit limit is the amount of money you keep in the account or a percentage of your balance. 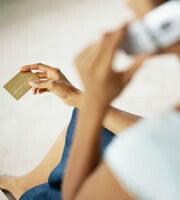 Some secured credit cards offer you interest on your savings account. The upside? You get a chance to improve your credit, and if you handle the card well for a year or more, the issuer might offer you a traditional, unsecured credit card. No matter which alternative you choose, make sure you understand the credit card terms and fees, and shop around for the best deal. 0 Responses to "Credit Card Alternatives if You Have Bad Credit"